Absolute Newsletter 7.0 is the latest version in a long-running line of online Newsletter Management software packages created by Xigla Software. Built by using experience from previous versions Absolute Newsletter 7.0 relies on extensive functionality to catch attention – and it does a great job in this field. Powerful and easy to understand this mailing list manager packs a large number of options that give excellent flexibility when working on such tasks. Users of this email newsletter software will find it to be very intuitive and easy to use while having all the necessary tools to successfully conduct e-mail marketing with well-written newsletters. The list of features of this newsletter management software is so extensive it would be hard to list all of them here but there’s a pattern as they are all small but useful enough to make working with Absolute Newsletter 7.0 a pleasure. There are a few outstanding points though that may give you a pretty good idea as to what this online e-mail newsletter marketing software really offers – users have access to unlimited subscribers and mailing lists that make reaching thousands of potential customers an easy task. You can also have unlimited users and administrators as well as support for templates that can make your e-mail marketing newsletters more noticeable. Absolute Newsletter 7.0 includes integrated social share features for web sites such as Facebook and Twitter too. Furthermore, there is automatic detection of bouncing e-mail messages. Once detected users who generate them and the messages themselves automatically get removed from the database, which increases the overall efficiency of the work you are doing. 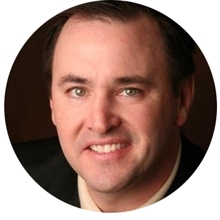 This is an excellent feature that can make the difference between your online marketing company and the competitor that sits next to you. But Absolute Newsletter 7.0 also stands out with additional features that are often an exception. 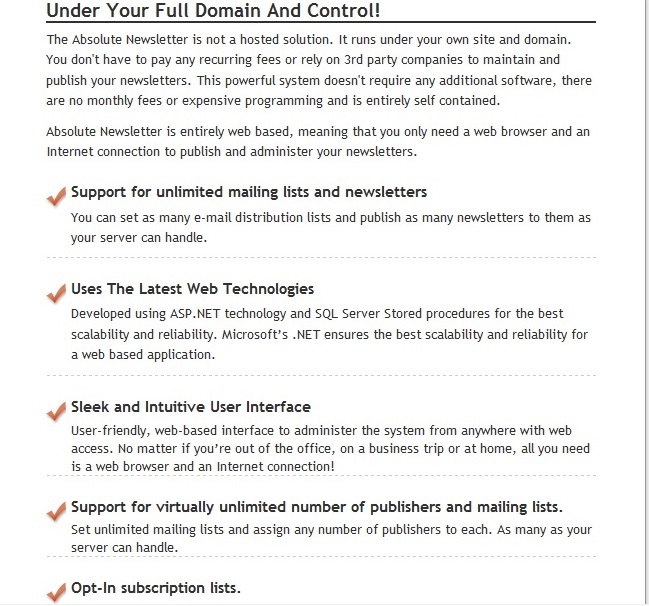 This mailing list manager is not a hosted solution, which means it runs under your own domain and web site. Thus, it gives you the opportunity to be completely independent from 3rd party companies and saves you a lot of money in the form of maintenance or monthly fees. You don't need any additional software to make the application run as once installed it is completely self-contained. What’s even better is that this mailing list manager does support SSL, which allows you to use Google's SMTP Server or any other SSL-based SMTP Server - a feature that is rarely seen in such software. 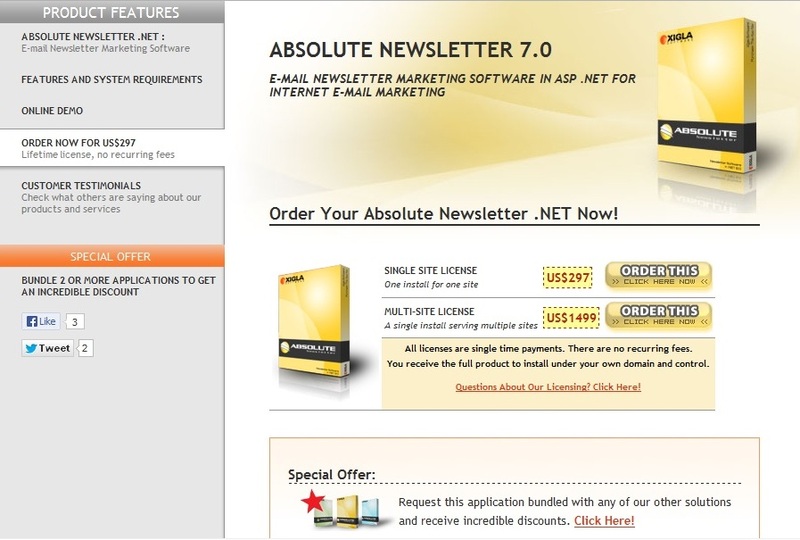 Finally Absolute Newsletter 7.0 makes use of the latest web technologies such as ASP.NET and SQL Server for the ultimate experience in the e-mail newsletter marketing software. To make the software more accessible and to demonstrate its really extensive features Xigla Software has prepared a live online demo that is accessible to anyone interested in the software. Potential customers can log into the system and take a look at different aspects of the newsletter management software depending on their needs – you can have a look at system administration, subscriptions and sample newsletters and see where your hard-earned money will go. So far so good but do you have what it takes to run it? Fortunately, the folks at Xigla Software have taken care of that too. Despite the extensive features and functionality Absolute Newsletter does not require much – you need a Windows-based server, which supports Microsoft's .NET Framework. In addition, you must be running ASP.NET version 4.0 or higher and SQL Server 2000/2005 or newer. As seen the hardware and software requirements are not overwhelming, which makes for an easy implementation and an immediate start - definitely a great plus! As with everything else Absolute Newsletter does have shortcomings but they are not crucial – apart from the learning curve you will experience, the software does not offer any other features not related to e-mail online marketing so you won’t be able to use it as your everyday e-mail software. Also, the multi-site license can be a bit costly for some users – Xigla Software asks for USD 1499 but luckily there’s a cheaper USD 297 version that serves a single web site. The good news is that these are single time payments with no additional fees and you can download the software online, which will save you some more money. All in all, Absolute Newsletter 7.0 is a great product for online e-mail newsletter marketing. It has a large number of features, the latest technologies, flexibility and ease of use and it does not cost that much. All these characteristics combined make for a great product that definitely should not be overlooked. Absolute Newsletter 7.0 combines everything you need in one powerful and useful software product that will help you reach millions of potential customers. Definitely recommended!